Saturday, me and my best gal pal, Carrie, headed out for a girl's day of shopping. We are two peas in a pod and each of us loves Goodwill just as much as the other. So, that's where we went. I was able to find a bunch of items on my wish list that day. One of the things I spotted was a really cute wool sweater from Gap. I find wool a little on the itchy side for wearing, but, no matter 'cause that's not what I was wanting it for. I wanted to make mine into a bag. You may have seen these cute little bags flying around bloggy land. I pulled the article out of an issue Country Living quite a while back. Now I finally had a wool sweater to make one with. I, however, did not take a before (or during) picture. Bad blogger! Bad, bad blogger! *Hanging my head in shame. 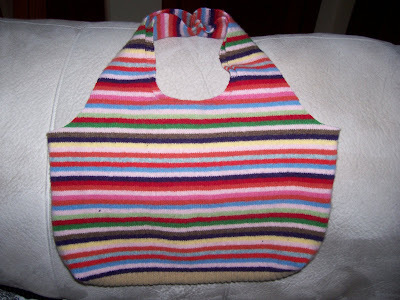 I will show a picture of the finished bag before trying to explain to you the extremely quick and easy process it takes to make one. Ready? Very cute, if I do say so myself. The first thing you must do is wash your sweater in hot (I used warm) water and then put it in the dryer. This will felt the wool and make it look like something that might fit your 7 year old niece. The next thing I did was lay my sweater out flat on a cutting mat and cut the sleeves off using a rotary cutter. If you don't have a rotary cutter, feel free to use scissors. But, whatever you use - don't try to cut the sleeves off with a butter knife. That would be bad. And fruitless. I made the opening quite a bit larger than the original arm holes. After cutting the sleeves off my little striped sweater - I cut out the opening of the neck hole. This made the sweater look somewhat like suspenders on a belly girdle. A bad belly girdle that would only fit your 7 year old niece, who more than likely doesn't need a belly girdle to begin with. This is probably much more simple than it sounds. And I promise the next time that I make one of these, and I will make more of these, I'll take before, during and after pictures. Now to stitching up the bottom. I flipped my sweater/suspender/girdle thingie inside out and stitched the bottom closed. After many snapped threads, I realized that a zig zag stitch was the way to go here. Spare yourself some frustration and start out with a zig zag stich. Mkay? I didn't want a straight bottom on my bag, although that would be perfectly fine. I wanted one of those boxy bottoms. 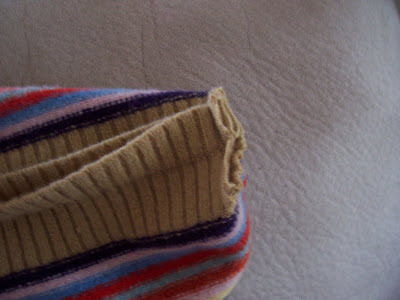 So, I flattened the sweater out to make the seam in the center of the fabric with ends that looked like triangles. Then I stitched a line on each side to make the triangles hold their shape. This makes the bottom of the bag boxy like this. Once again, I'm sorry for being a bad blogger and not taking pictures. But this is what the bag looks like from the inside after I snipped those little triangles off. The last thing I had to do was finish the straps. At this point the two straps are connected front to back. So, I cut them and then reconnected them. This time I sewed the 2 front pieces together and the 2 back pieces together. Remember to use your zig zag stitch. Honestly, it probably only took me a total of 15 minutes to make this. It wouldn't have taken that long if I hadn't kept snapping my thread at first. This is cute as is or I may end up embellishing it. A cluster of buttons in the corner would be cute. Actually, there would be a ton of embellishments that could work here. 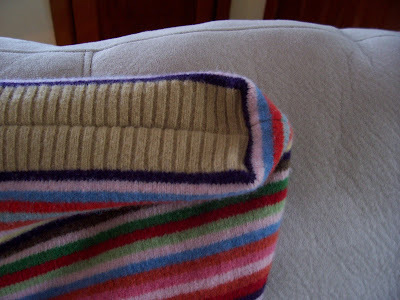 I could also cut out another piece of felt in a solid fabric and sew it on as a pocket. The options are really only limited to the imagination. I thought that these would make cute, inexpensive Christmas gifts. Imagine giving one of these to a knitter or crocheter in your life filled with yarn and knitting needles. Or it would be cute to give with a coordinating hat, glove and scarf set inside. Once again, the options are endless here. Well, I hope I didn't confuse you too badly with my instructions. Just in case, Country Living has this project on their website, too. 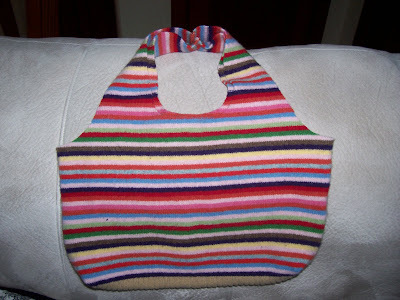 Pam, thanks for commenting on my post about my felted bag! I came over to see your felted bag. It turned out so cute! I have that exact Gap sweater felted and ready to transform! Mine looks a lot fuzzier than yours though. Maybe it's because I washed the two sweaters together.